life and conservation in the heart of africa. In a few weeks I'll be off to South Sudan for a new job, new country, new adventures. Since I'm sure I'll get a lot of questions about this, I thought I'd write up a post of FAQs! A. South Sudan... where is that? Q. The Republic of South Sudan shares borders with a bunch of neighbors: Ethiopia, Kenya, Uganda, DR Congo (much farther north than where I was), Central African Republic, and Republic of Sudan. I'll be based in the capital, Juba. South Sudan voted for indpendence from the Republic of Sudan in a referendum in January 2011. The vote was part of a peace agreement that ended the war that begain in 1983. The country officially became indpendent in July 2011, making it the world's newest country! The BBC has a pretty good country profile of South Sudan with a short history, some basic facts and photos. Q. Who are you going to work for? A. I'll be working for Wildlife Conservation Society. It's a US-based organization, you may also know as the folks who run the Bronx and Central Park zoos! It's one of the oldest zoological societies in the world, and a leader in both ex-situ and in-situ conservation as well as wildlife research. WCS has a page on their website describing the South Sudan program, which has been active on and off for many years. Q. Isn't it just, like, desert there? A. Actually, not so much. The Nile river flows right through South Sudan, and there is an enormous flood plain of wetlands and swamps called the Sudd, as well as grassland on both sides. There are also mountains, forest and lots of savannah. That makes for a diverse country both biologically and culturally. In 2007, after the war ended, WCS confirmed that massive numbers of key species still exist in South Sudan. 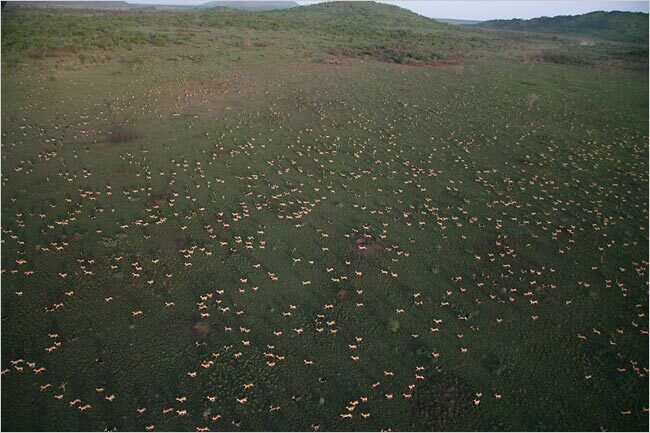 Hundreds of thousands of kob and tiang (types of antelope), gazelle, elephants, and other wildlife make an enormous migration across a number of national parks and unprotected area. Check out this gorgeous slide show on the New York Times of photos from WCS and National Geographic. WCS is doing a number of different things in South Sudan to support conservation of this amazing phenomenon and resource including policy work, supporting management of national parks and conducting surveys and research to better understand the needs of the wildlife. There is a video of GPS elephant collaring here on Reuters. This video from WCS gives a good overview of the unique wildlife and important opportunities that exsit to conserve it right now. Q. That's awesome! So what are you actually going to be doing? A. My main role will be to work on management plans for the various national parks in which WCS works and supports the government. Because the national parks are in a new country, the planning and management must be done from scratch, along with the development of enviromental policies and agencies. I'll be based in Juba doing a lot of work on my computer, but also organizing workshops and having loads of meetings with stakeholders in order to build the strategies and write the planning documents. I hope I'll get a chance see some of that wildlife too at some point! A. I am no expert on the political situation in South Sudan, but the short answer is yes to war, no to ebola, not really to scared. After decades of war, South Sudan gained independence in 2011, followed by a period of relative calm and hope for the new nation. Unfortunately, long standing internal differences and political rivalries came to a head this past December, 2013. Serious fighting between army and rebels broke out across much of country, including Juba, and thousands were killed. Violence continues in many areas, although not, for the most part, in Juba itself. While peace talks are now underway in Ethiopia, the situation is still very insecure. To manage the situation for staff, WCS, like other organizations that work in insecure locations, has solid security protocols in place. These protocols mean life in Juba will be pretty restricted, but I feel very confident that I'll be safe. Q. When do you leave? A. I'm not sure yet but probably mid-month... I will try my best to post updates! Boys at Mt Hoyo in 2010. I’ve now been in Congo – mostly – since January 2009. More than 4.5 years. What have I learned in that time? So, so much. But one thing I have not learned nearly as much as I should have is French. In fact, it’s kind of embarassing how little French I speak. And even I wonder sometimes how I manage to not only live here, but run offices and manage staff and keep entire programs going! It’s a combination of having very good staff that speak English and depending on the patience of others. Many people would imagine that the most difficult part of traveling or living in countries where you don’t speak the language would be when you need something that you can’t explain. And sure, that’s annoying but not really as stressful as you might think. If you are already in need of something and are at the mercy of others, humiliating yourself with a little sign language is no big deal. In fact, it often endears you to people who find your situation a bit pathetic and/or amusing, and are willing to help out. If you are really desperate, if something is really wrong, people will know from your body language and tone, and most do their best to assist. It helps that in Congo, most people don't learn French as a first language, or even a second. French is the language of secondary school and government. The vast majority of kids don't learn French until school (if they go at all). At home, people speak their local language(s) and use Swahili for trading. It's not uncommon for people to speak four or five languages. For this reason, generally, people are very forgiving of bad French and flailing hand gestures. Sign language and miming is perfectly acceptable for "crazy muzungu goofing around and photo taking" type activity. When it comes down to it, the most frustrating part of not speaking the language is when I need to stand up for myself. Standing up to police who have pulled me over for no reason, in meetings with officials who are pushing their weight around, to staff who have disobeyed instructions… in those occasions sign language and fumbling just makes you look like a moron. That’s the last thing you want. The other morning, the police stopped me at an intersection. Why, you ask? It’s Congo, friend. That question does not apply. The event that led up to it was me stopping at a red light, while a minibus careened from behind me, into the other lane around me and shot right through the intersection even after cars had started going the other direction. Clearly, this meant I had to be stopped, told to back up because I was too close to the line of the light, and instructed to roll down my window and give the police a bottle of water and money. In times like this, there are SO many choice things I want to say. I want to be logical and cutting. Angry and sarcastic. I want to put them in their place and point out the ineptitude and ridiculousness. Admittedly, my French is better if I have a little prep time, I’m not flustered and angry, and I’m not on my way to my 7th straight day of meetings with the government without having a cup of coffee. But still. Sometimes, when I consider that I have been able to successfully complete large and complex projects here in Congo for the past three years, I wonder how amazingly productive and effective I would be if I did speak French. I daydream about the heights of conservation impact I’d reach and multitude of outcomes I’d be delivering every day! rwanda has quite an important tea industry. or rather: tea is an important part of the rwandan agricultural sector. given that it's a tiny country, i'm not actually sure how much of the world's tea is produced there... apparently it's a pretty small percentage. it makes for quite a pretty crop in the hills around gisenyi. up in the high altitudes, where it rains a lot and it's pretty much always cold and misty, you find huge valleys of brilliant green. it is scattered between other farms growing cabbage, carrots, potatoes and yams. it's particularly picturesque with congo's niyragongo volcano in the background, just across the border. a while ago, while in gisenyi working on the [goddammed] audit, the roommies took a break to make some art. in the grass lawn, under a moonless sky, armed with glow sticks and a very slow shutterspeed, we had a ton of fun. and it's a work out trying to get these shapes formed across a huge empty space! the perfectly spherical globe is really tricky. of course the jellyfish is my favorite. team work! i've been spending more time up at the park the past couple months. lubumbashi is boiling hot but the rains have started in lusinga, and work makes an excellent excuse to retreat to the cooler, breezer climes of the plateau. however, with the rains the park will become more and more inaccessible so we are trying to cram as much as we can into the last few dry-ish months. we've had a number of activities going with the park rangers, including training on gps and developing a new data collection system, pre-selecting new rangers and a workshop to map out the content of the general management plan. these are some of our big outputs for the year and so it's been good for me to be able to come up and be part of that. one of the things that coincides with the onset of rainy season is that the zebra arrive near the park hq. they come to eat the young shoots of grass, especially vibrant this year after the whole plain was burned. the grass has come in quickly and the zebras are now just within walking distance. they don't let you get too close, though. the male snorts and shakes his head and then trots off to lead his ladies away. speaking of the ladies, it appears several are pregnant and we hope with the new foals our little population will hit 40 this year. we shall see. when life gives you rotten bananas, what else can you do but make banana bread? this is currently true for me both metaphorically and literally. luckily, i'm up at the park with a beautiful view and a newly built wood oven. mix all that together, roughly in that order. pour into a greased tin pan and put that in a hot brick oven full of burning wood. wait 45 minutes. check it. probably leave it another 30 minutes or so until you can put a knife in and it comes out clean. the lesson: don't be afraid of banana bread coming out wrong. anything with delicious ingredients and a bit of good intention will be alright in the end. even if it's baked in a crappy tin pot. also, even mediocre banana bread tastes better with a view. on the long long road from lubumbashi to lusinga, there is a little town called bunkeya. the other day we stopped to buy rice, tomatoes and snacks: popcorn and peanuts. when the battery decided to conk out, we were there for a little longer than expected so i took out my camera. as usual, i mostly got people running, hiding or yelling angrily in my direction. but a few kids and a group of ladies selling rice were a bit better humored. and a little farther down the road, in a hot dry village in the middle of nowhere, bertrand and i entertained some more kids, eager to show off their karate poses. going on our fourth day without water in the house/office, i thought i'd talk a bit about bucket showers. yes, bucket showers. in beni, you may remember, i had running water less than 25% of the time. but i also had a well. and a system. systems are important. every morning the gardener filled 6 big buckets with water and refilled them after morning showers, laundry or whatever else needed doing during the day. while it wasn't running out of the tap, we never ran out of water. in this house, however, the water sometimes just stops and there is no well. given that we've got 3 people minimum living here, and sometimes up to 6, it's easy to run out completely. let me tell you, there is a unique type of panic that sets in when the toilets can't be flushed and hands can't be washed in a house full of men. to prevent nervous breakdowns and cholera, each day, the driver takes the 6 bidons (big plastic yellow jerrycans) to a public tap somewhere in town where there is water and fill them up. we then use that water for everything from washing bodies to washing dishes to flushing toilets. that is until its the weekend and the driver is at home and the rest of us flounder helplessly... but that's another issue. in this context, i have had to take many bucket showers over the past few years, as have the majority of people living around the world with little or no running water. so in the spirit of lots of helpful how-to blog posts on everything from preparing couscous to making a french knot, i thought i'd do a how-to on the essential skill of taking a bucket shower. bucket showers are a vital part of life and a good, hot bucket shower is nearly as satisfying as a regular shower. (ok, that's a lie but one i like to tell myself.) and, when you are water-limited, it's important to know how to get the most shower out of the least water. 1. fill your bucket up about 2/3. it doesn't look like a lot of water, but trust me. 3. use one big cupful to just get your hair wet and splash a little water on the rest of you. shampoo. 4. use two big cupfuls to rinse out the shampoo. apply conditioner. 5. using the water that's on you from washing your hair, soap yourself. 6. use three big cupfuls to rinse out conditioner and rinse yourself. remember to switch hands so you can wash both arms. 7. be amazed at how little water you actually used. consider whether you should save the rest for a later shower or hand washing. if you have ample supply or are feeling sorry for yourself because you hate bucket showers, even hot ones, pick up the bucket and slowly pour the rest of the water over your head with your eyes closed, pretending like it's coming from a showerhead. you are clean! bucket shower success. but i did head back to serengeti for an fzs workshop. these are some photos. it's funny... i spent 80% of my time there in meetings and 95% of my time in congo in front of my desk or asleep, but you'd think from this post i'm out frolicking in the wilderness! i guess it gets back to what i mentioned in my post in december... most people work to live and in my case it's not really any different... the only thing is the my work puts me a bit closer to the places i want to do my living.... and my living can be quite extraordinary. case in point: even though we just had a couple hours to set out in the morning before meetings, it was pretty amazing to catch a glimpse of these three male lions loving on each other. we found them making their way across a big open plain. three bachelors. they couldn't help but stop and cuddle every few minutes! they'd walk apart and then get in really close, rubbing cheeks and sides against each other... and then just drop down and start wrestling. so so cute. you could almost forget, just for a second, how extremely scary they are. but the eles... they are my favorite. growing up in thailand we got so used to seeing elephants everywhere. petting them, feeding them bananas, seeing them in rural towns and villages... i didn't feel any more scared walking up to an adult elephant than i did a dog! i can still remember the feel of their wrinkley, leathery skin and thick hairs, and that they like to be scratched, the way their trunks curl around your hands or search your pockets for treats. the way their eyes are a warm reddish brown color and seem a little too small for their bodies, but their long long lashes make up for it. i didn't realize until recently quite how amazing and unique that experience was. i have been so close to elephants and yet i am still drawn to and in awe of them every time.